There's an old Jewish joke that explains that there are only two types of people in the world: Jews, and those who wish they were Jews. While this is a rather dry take on 5,000 years or so of persecution, if there is one thing in A's experience that does tend to get gentiles excited about Jews, it's the food. The typical Ashkenazi food is no exception (see our recent post on breaking the fast to get an idea of what modern Jewish cooking looks like). For those who wish they were Jews and who don't know where to go for a decent bagel, the strongholds of Golders Green, Totteridge and Stamford Hill provide inspiration but are perhaps a little way out of town. Fortunately, two bagel bakeries on Brick Lane still do a roaring trade, and though other Jewish institutions such as Bloom's have bitten the dust, the bakeries provide a glimpse into the old Jewish East End. Jews moved into the East End in the 19th Century but they have slowly been replaced by Bangladeshis (and more recently by hipsters and City-boys). For those in the know, there are still a few remnants of the Jewish East End left: an old synagogue still holds services on the Commercial Road, Glickman's still operates in Watney Market (albeit under Bangladeshi management), the sign for CH. N. Katz's string and paper bag shop is still visible on Brick Lane, and there's an active Jewish cemetery tucked behind the Sainsbury's in Whitechapel. 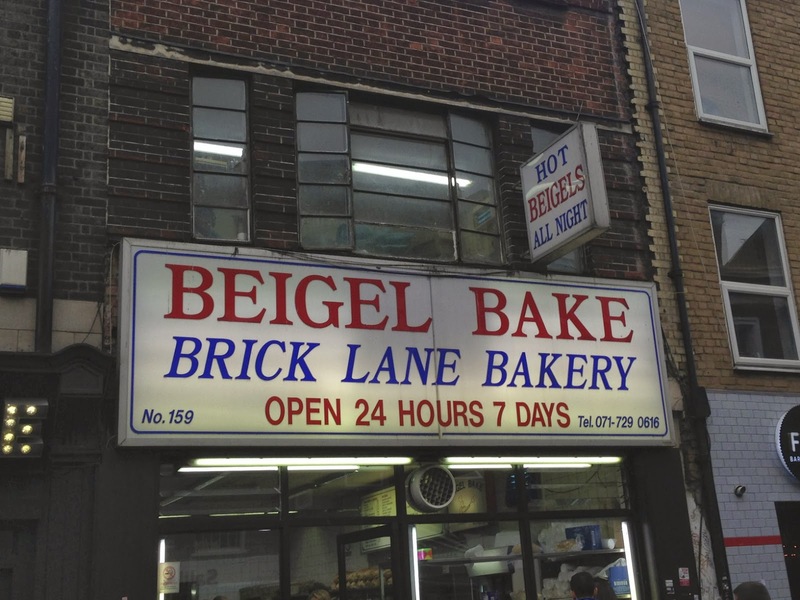 Among all this hidden culture, the Beigel* Bakeries of Brick lane are the only obvious fly the flag for Jewish culture in the area. Up at the top of the main drag just south of Bethnal Green road, these two places are institutions in a way that Bloom's once was (though without the grumpy waiters): one of the two even claims to have never shut since 1988 or something crazy like that. The places aren't kosher - they're 24 hour and the will make you a bacon sandwich - but they are the real deal. the bagels are made the traditional way, with results that make the mouth water. Each batch is gleaming, chewy and absolutely comparable with the best of the North London bakeries. 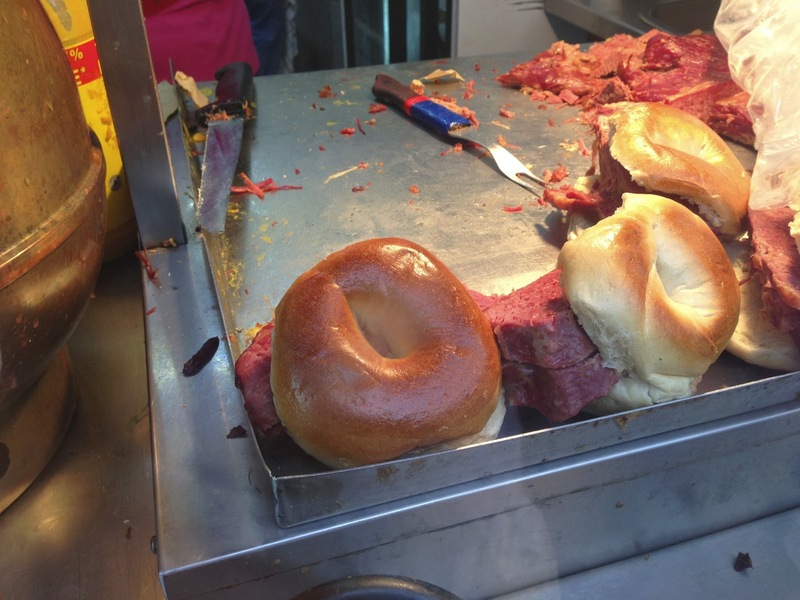 The brisket that comes in the bagels is also cracking. It's beautifully salted, and has clearly been cooked forever. It flakes very easily and almost melts in the mouth. They also pack the rolls very full here, and will even chuck in a couple of pickles and some mustard if that kind of thing is your bag. 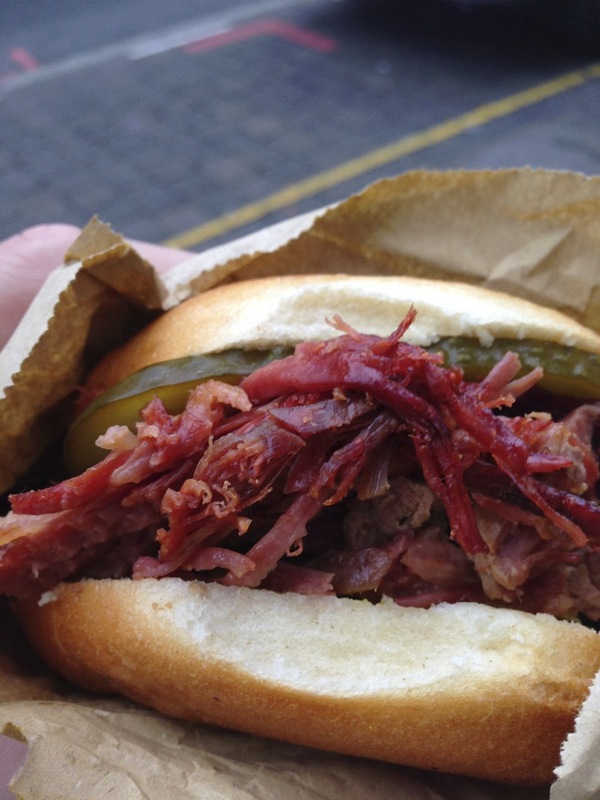 For under £4, a salt beef bagel works out cheaper than your average doner. Given that it's open round the clock and is near a host of clubs, this place is a way better pitstop on your way home from a boozy night in Shoreditch than the plethora of chicken shops and kebab places in the area. The other thing this place does really well is the biscuits. Jewish biscuits have a particular texture and consistency. A suspects this is something to do with the fact that they are often made out with dairy-free ingredients so as to allow for the maximum flexibility within the Jewish dietary laws but he doesn't know this for sure**. Despite not being a kosher bakery, the biscuits are still made the traditional way and we heartily recommend picking up a bag of them on a visit. As this is the East End, you can now get pies and pasties here too so amongst all the exotic food, there's still scope to get something familiar. 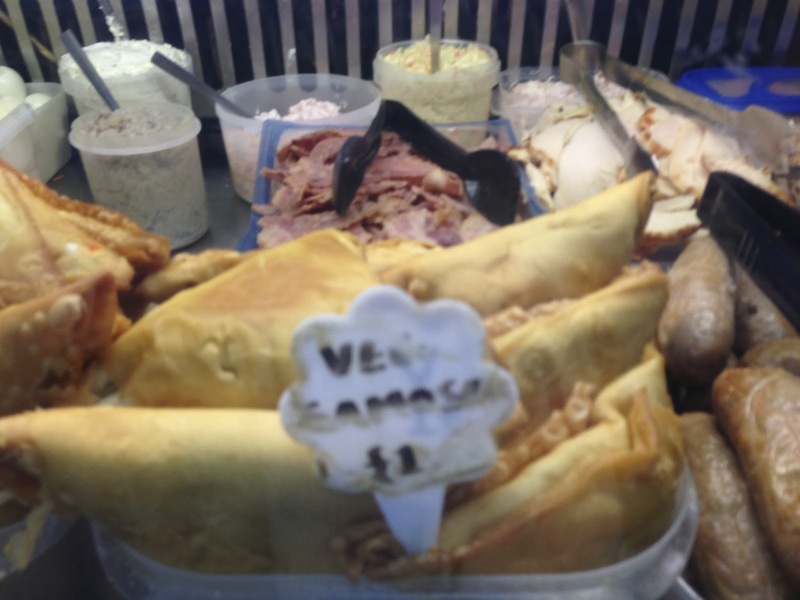 Ever enterprising, the places have even started catering to the current locals, and bizarrely the bagel bakeries also make samosas now. We can't vouch for their quality though. The only warning we can give is this: the place will spoil you. Once you've tried the real deal - and these bagels are the real deal - you will never want a New York bagel from the supermarket again. 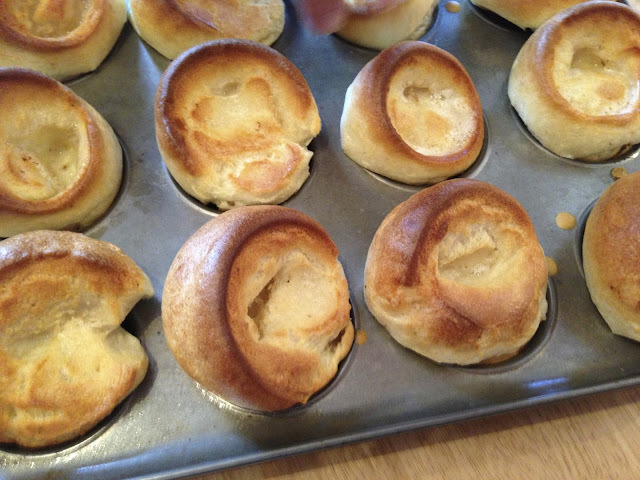 These things are a cut above, and suddenly those rolls with holes which roll off the production line in, er, Rotherham (true story) don't really seem quite as good as they did before. You have been warned. * Beigel is an alternative spelling and pronunciation of Bagel - depending on whether you're of Polish or German extraction will determine what you call these things. 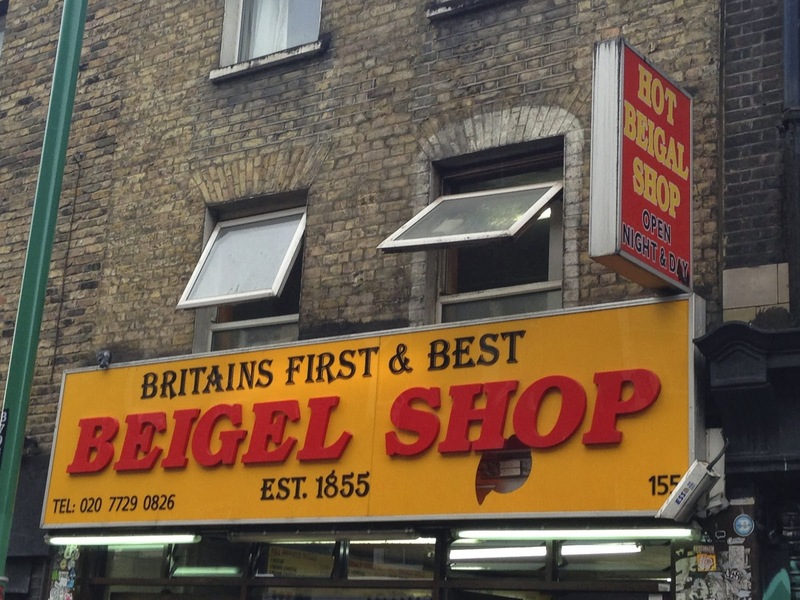 A's grandfather of Polish stock (who grew up round the corner from the Beigel Bakeries) calls them "Beigels". His other grandfather who is of Austrian ancestry, insists that they are called "Bagels". ** Comments are welcome on this point. 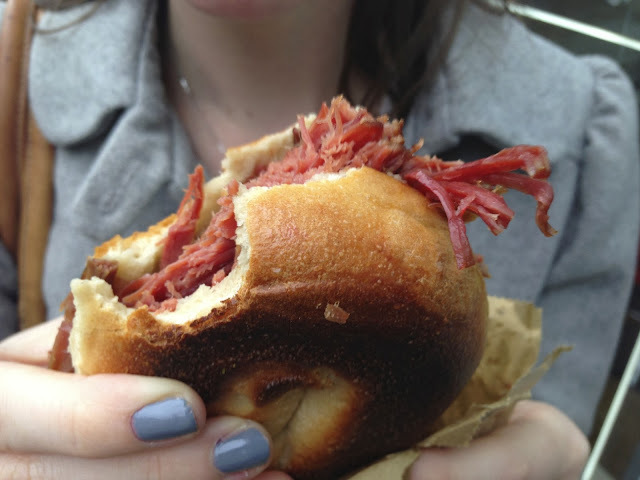 great post and now i'm honestly thinking of getting on the tube to go down to Brick lane... I am SO hungry. We used to stop off here after clubbing back in the 90's... so good as a midnight treat!